With 2018 coming to a close, I’m looking back on the progress I made toward my goal (announced in August, oops!) of starting an all-metal Skaven army featuring some of the old-school figures I coveted in the pages of White Dwarf when I was a kid. Of course, the project has caveats — namely, I was building the army for Dragon Rampant, not Warhammer Fantasy, so I could get away with a lot fewer figures, probably something on the order of 50 or 60 total dudes (instead of the 150+ models that are typical for Skaven hordes). And today I’m announcing another caveat — one that you probably saw coming. I have decided that I will be including plastic models where appropriate, particularly for large-scale monsters or war machines. With that, here’s a look at the progress I’ve made to date. First up, a nearly completed unit of 12 Plague Monks, featuring some of the old-school Marauder Miniatures Plague Monks and Censer Bearers. I did a few basic weapon swaps and gentle arm manipulations to add some variety, but for the most part these guys are stock. I really enjoyed coming up with the drab-yet-varied colors for their cloaks and robes. I’ve got three more Plague Monks to go before this unit is complete! They’ll be represented by the Elite Foot profile in Dragon Rampant, with some special rules to model their overall nastiness on the battlefield. Moving on, I completed a couple more character models: a warlord and a warlock engineer. Both have already seen action in the Mayhem at the Stoic Arms battle report from last month. This figure is absolutely ridiculous with detail. The little rat buddy perched on his backpack is actually re-loading his warplock pistol! And then here’s this warlord. He was missing his rather cool tail/banner pole piece, so I had to replace it with a much less awesome tail. But he’s done, and ready for battle! Hmmm, that blue is looking a little too electric and bright. In reality it’s rather dull, which I like. Maybe it’s the fluorescent lights in my workshop? The blue is really noticeable on this ratling gun team, which is the last of the Skaven figures I painted up this year. Again, the blue really isn’t that bright. It’s just the lighting. I’m actually pleased with how the blue turned out in real life, so much so that I’m going to be using it for my (eventual) unit of 12 Gutter Runners. Seems totally achievable in 2019, right? The best part about this project is that I’ve been able to use the individual models I’ve been completing throughout the year in a variety of small-scale skirmish games, such as Song of Blades & Heroes and Open Combat. Look for more of that in 2019! This year I also knocked out quite a bit for my Death Guard 40k army, too. All in all, 2018 was a fairly productive year, particularly when you consider that my son was born in January, so I spent the entire year parenting a newborn! And 2018 was also the year that my 3-year-old son started to become … intensely … interested in my hobby stuff. He began identifying everything on my workbench as “goblins” and quickly learned the phrase that has become his mantra of patience: “One day I’ll get to play with those!” He’s a good kid, but he’s also in that little boy phase where everything he does is inadvertently destructive. Hopefully that one day will come sooner rather than later! We’re back with another faction writeup for our Caluphel Awakenings campaign. This time we turn the reins over to Paul for a glimpse at the backstory and motivations of the L’Ranna Regiment, his long-running Tau army. The L’Ranna Regiment is relatively new compared to some of the storied units of the Tau Empire. 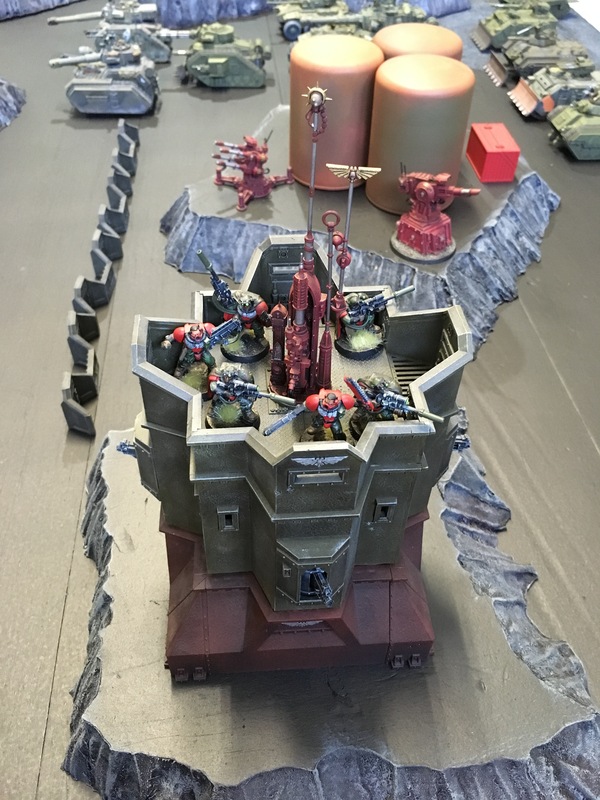 Following the Emperor’s abortive Damocles Crusade (742.M41), Shas’o Shovah Commander Farsight set up his Farsight Enclaves on the far side of the Damocles Gulf. The Ethereal Leadership found it appropriate to guard against the rebel Commander and thus set up a defensive presence on the nearest Septs, particularly Viorla and Sa’cea, on the western rim of the Tau Empire. The Company was originally founded as part of the Fire Contingent garrisoning Sa’cea against a possible rebel incursion. In 889 – 903.M41 the hive Fleet Gorgon invaded Tau space. Gorgon was exceptional for its ability to quickly adapt on a biological level to new circumstances of battle, such as evolving immunities to Tau weaponry. The initial push by Gorgon was so devastating that the garrison forces on Viorla and Sa’cea were pulled off and sent into combat. It was on the manufacturing world of Davos, Bork’an Sept, that the Company was birthed in its crucible of fire. 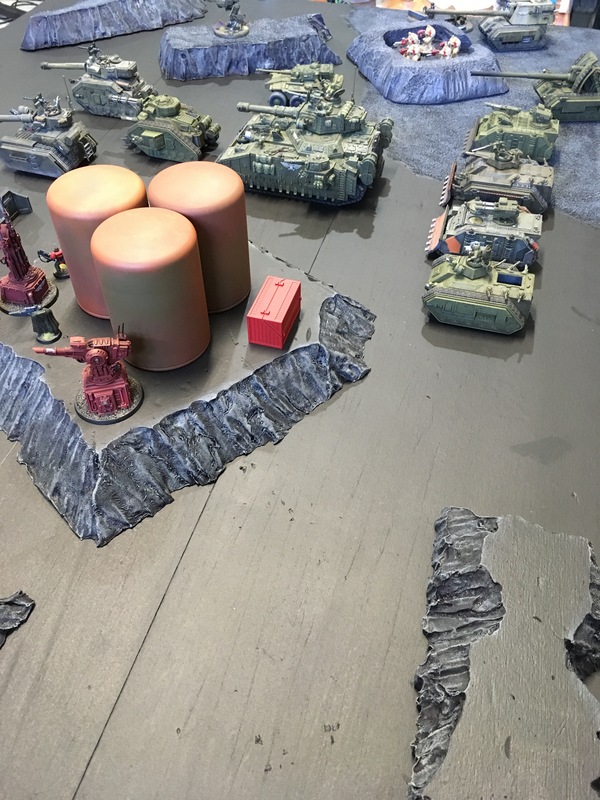 The larger regiment was ordered to defend a munitions manufacturing city while the fleet redeployed. Just after the fleet moved off, a rift opened in the Warp and Tyrant Hive Mother Medusa with her full brood manifested and began their assault on the city. Most of the regiment were lost within the first few hours of the Tyrant’s assault. Night fell when the last distress transmission from the regiment made it off-world. The fleet returned at daybreak the next day and landed reinforcements expecting to find Tyranids in control. The city was deserted and adrift with smoke. All was silence on the battlefield when landing party found, still at their posts, the victorious Company, exhausted but alive. The rescuers set up a clamor, banging their guns against their shields crying aloud “L’Ranna! L’Ranna! L’Ranna!” L’Ranna is a Tau word that describes the stillness of a battlefield when all that is left is smoke and the last quiet whimpers of the dying enemy. From that day forward, company colors would be that of blood and smoke – red and gray. Shas’o Shaserra, Commander Shadowsun herself anointed the Company L’Ranna and promoted their remaining lieutenant Nyessa to Shas’el Captain Goldmoon. The Gorgon offensive was eventually destroyed in 903.M41 due to the combined efforts of the Tau and the Imperial Guard 903. Shaserra took Nyessa on as pupil and began to train her in the sacred Code of Fire and the all-important law of the Tau’va. Over the next 90 years the Company saw repeated action against the enemies of the Tau, capturing banners of the White Scars Necrons and multiple Ork Waaghs! during the Great War of Confederation (975.M41) just prior to the Third Expansion (current year 975.M41). 975 was a year that changed the destiny for the Company. Under the orders of Shadowsun herself, Shas’el Goldmoon led the Company on the assault of the tundra mining world of Aggoroleth. There, the Company battled the forces of the Adeptus Mechanicus for the resources of the planet and its rich promethium reserves. During one particular explosive assault by Legio Valorian Titans, the Company found themselves pinned and suffering mortal losses. It was at this point that the sky filled with the descent flares of an entire contingent of Crimson Crisis Suits. Shas’O Farsight had arrived. Under the withering fire of ten thousand fusion blades, the Legio was turned back and then (over the next month) expelled from Aggoroleth entirely. Goldmoon was somewhat at a loss for how to respond to the new affairs. On the one hand, she was presented with the great traitor to the empire — Farsight himself. Honor and the Greater Good itself would call for her to immediately assassinate the commander. However, she owed her life and perhaps the lives of the Tau within the entire Sept to him. What did the Greater Good demand of her? Before departing the world, the two of them walked long hours together talking, and when they departed, they made the bow of respect to each other. As the Company returned to Tau Sept itself for orders, dark times engulfed the Empire. Utilizing archeotech and eldritch science, the Tech Priests of the Adeptus Mechanicus had their revenge for the loss of Aggoroleth. An eruption of power engulfed the vast swathe of the Damocles Gulf space in flames, cutting off the Tau from their destined coreward path. The Farsight enclaves were marooned on the far side of the fiery Gulf. To the East lay an expanse of dead space, barren worlds left in the wake of Hive Fleet Gorgon’s ravenous invasion, and to the South lay the mighty Ultramar and the sons of Guilliman. The Tau found their space lanes cut off on all sides with no obvious route towards new conquests. Add to this the disastrous Tragedy at Numenar Point where the entire Fourth Expansion was lost and the galaxy itself was split asunder. Over the next few years a malaise set upon the empire. It was during this period of drift that Shas’O Nyessa Goldmoon was put on trial for treason, given her failure to kill Farsight when given the opportunity. The trial consumed the media channels of the empire for months. Witnesses from both sides spent days petitioning the Ethereal Council and throughout it Goldmoon made her defense. When the very colors of her Company were raised as proof of her false allegience, she uttered only one word: “Davos”. In the end, it was the testimony of Shadowsun who swayed the Council and Goldmoon was released back to service and the Company was expanded to a full Regiment. But the Council was not entirely certain, and when the L’Ranna Expeditionary Fleet set out once more, the Ethereal Aun Ja’xa accompanied them. As the Regiment battled Ork Waaghs to the South, the Galaxy torn assunder by the Great Rift. But then a light in the darkness. 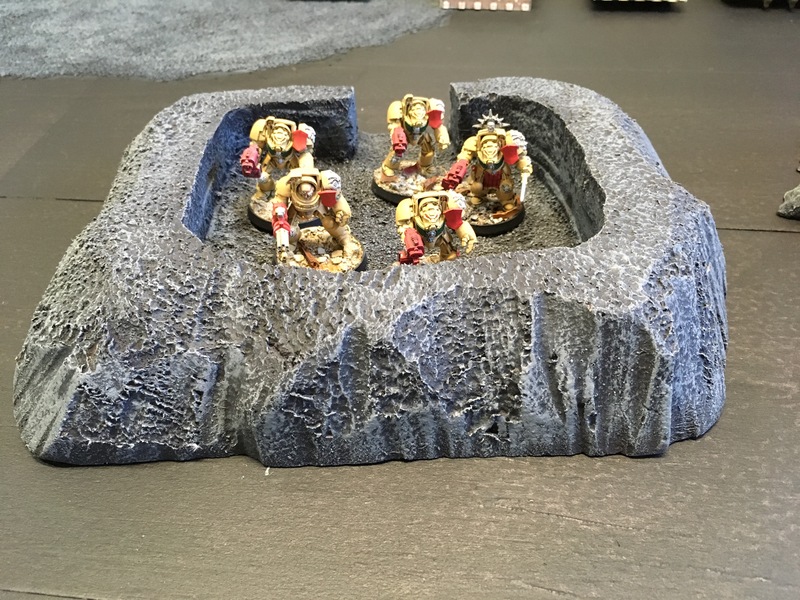 A stable womhole in the Zone of Silence was discovered – the Nem’yar Atoll – leading a trio of lost Septs far far to the Galactic North of the Empire. Furthermore as the Empire fortified the space around the Atoll, the lost world of Caluphel was discovered at the far east of the Zone. The Empire decided that perhaps expansion to the East could be countenanced. Or at worst, her enemies would be denied that territory. The Regiment battered by Warp Storms upon arriving in the Caluphel system and immediately found themselves without Beacon contact and besieged by competing factions for control of the Death World. However, the Regiment has won more than it has lost on Caluphel and has recently reestablished contact with the Empire. Goldmoon will need all her skill and ingenuity to fortify the Tau beachhead in the sector . . . and to survive. Shas’O Commander Nyessa Goldmoon: Goldmoon is the Regimental Commander. She pilots a Coldstar Commander Battlesuit with Glory colors. Shas’el Fireblade Huma. Huma is First Captain of the Damocles Company. He transferred to L’Ranna during the formation of the Regiment. He wears Farsight colors due to his HQ Command status. Shas’el Darkstrider. The legendary Darkstrider has joined the L’Ranna regiment where he leads his own Breacher Team. He wears Farsight colors due to his HQ status. He is 2nd Captain of the Damocles Company. Shas’el Longstrike. Longstrike is the Captain of the Nova Company. He pilots a Hammerhead painted in Farsight colors. Shas’vre Alhanna. Alhanna leads the Crisis Suits of Damocles Company. She has painted her Crisis Suit in Sa’cea colors. Ethereal Aun Ja’xa. A student of Aun Shi and a Master of the Blade. Ja’xa is a good match for the martial tradition of L’Ranna. He is watchful of his new Commander.